You can download example databases for MySQL at http://dev.mysql.com/doc (Scroll down to Example Databases section). By the time I’m writing the article, there are 4 sample databases available on the page. I choose the world database since it compatible with all MySQL version. Download the sample database “world database”. Extract it, you’ll get the world.sql file to the Database PC. This file will be imported to MySQL in few steps later. On the database PC, open command-line mode. 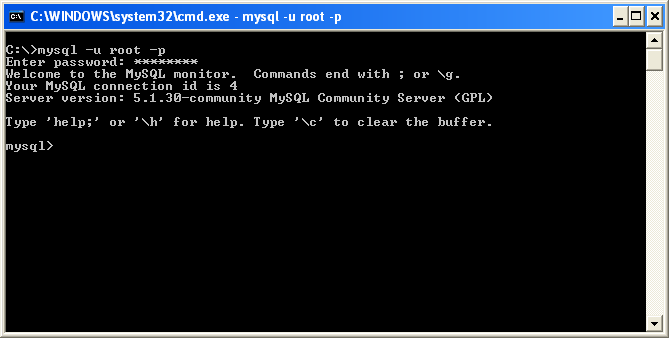 Type below command to connect to the MySQL Server using MySQL’s root account. The parameter -p makes MySQL ask you to enter the password. Then, type the root’s password. In this example, it is “password”. Note: You can type this command on any path because I have added MySQL path to system environment while I was configuring MySQL Server on the previous part. Now I have connected to the MySQL Server. Next, I’m going to create an empty database name “world”. Then, change the default database to the created database. 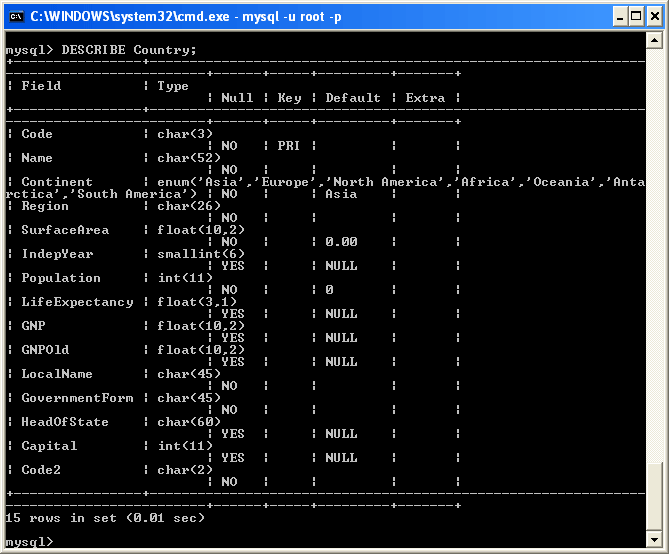 Next, load the contents of “world.sql” file into the world database. 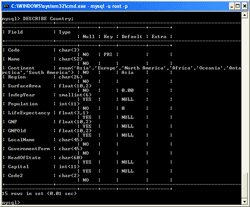 The “world.sql” file was created on the first step. You have to alter the path to where the world.sql file is located. 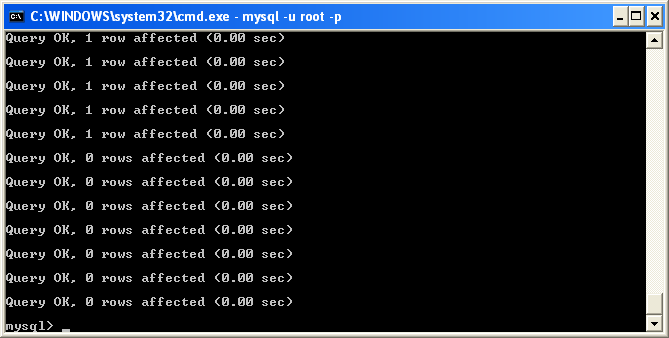 You’ll see lot of output that MySQL performs query from the world.sql file. After MySQL finishes processing the world.sql file, try to test if the query is executed successfully. Type the command below to list all tables on the current database. You’ll see that there are 3 tables. You also can see the columns on the table by type the below command. If you see the columns and tables as previous steps, it means that you have install sample database successfully. Setting Up the world Database – MySQL.com.